Sharpen and improve your soccer skills as you take on the competition and perform before a cheering crowd. Get a kick out of playing and learning on fields all over the world! 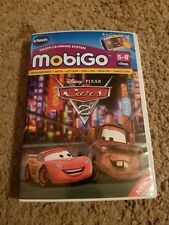 ~Disney Pixar Cars-Lightning McQueen, Mater, and the gang from Radiator Springs are back for an adventure that takes them all over the world. Disney Pixar Cars VTech V.Smile Smartridge Rev It Up Learning Fun New!! 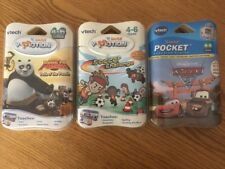 Disney Pixar Cars VTech V.Smile Smartridge Rev It Up Learning Fun New!! . Condition is New. Shipped with USPS First Class Package. VTECH DISNEY PIXAR CARS 2 INTERACTIVE V.READER LEARNING CARTRIDGE WORKS GREAT! Join Mater and Lightning McQueen in this V.Reader e-book based on the Cars 2 movie. The gang embarks on a worldwide racing adventure to see who is the fastest car in the world. Find out if Mater can make it as a super spy as your child learns core-reading skills. The vtech mobigo is preowned. 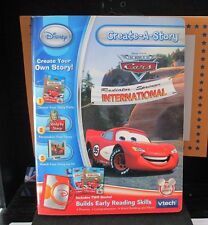 VTech Create-A-Story Disney Pixar The World of Cars Ready, set, read! Your child will burn rubber with the Cars Create-A-Story! Choose Read-A-Story mode to hear the Cars: Radiator Springs International story and to play various Cars learning activities. Great Deal! Refer to photo's for more information. Great preowned condition. Thanks for looking! Both Ages 4-6 years. NASCAR - Teaches: Vocabulary, numbers, addition, shapes and more. Both sealed. 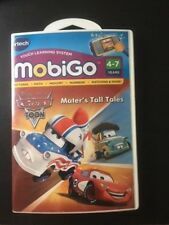 VTECH TOUCH LEARNING SYSTEM MOBIGO CARS MATER'S TALL TALES . Condition is Used. Shipped with USPS First Class Package. 5-8 years. NEW CARS MOBIGO. 15 ACTIVITIES TEACH LETTERS,WORDS,MATH AND LOGIC. TIRE SHAPED MOUSE. 3 CARS CHARACTER BUTTONS. Create A Story By Vtech. Building From Phonics, Comprehension. and Word Building Original Sealed. Your Story On TV. Vtech TOUCH LEARNING SYSTEM MobiGo 5-8years. Disney PIXAR Cars 2. Solve the puzzle to decode the picture. The item pictured is the actual item you will receive. New VTech V. Reader Cars Foreign Language Sounds Spelling. for 4-6 years. BRAND SPANKIN' NEW!! TOKYO MATER - (Cars, Pixar, Microsoft) For use with VTECH V.Reader Interactive e-Reading System Reading activities include watching a story written out, touching a word to hear it, reading games and an illustrated story dictionary. Game Ages 5-7 Condition is Like New with Open box. Includes all supplementary material, such as the User Manual. Shipped protectively in a box via USPS Media Mail. All shipping materials are recycle/reuse. We try hard to wade in the Green Stream. Consonant blends. long & short vowel sounds. vTech Create A Story. The World of Cars: Radiator Springs International. Reading Activities. For use with V-Reader Interactive E-Reading System. Help Lightning McQueen win the race with Ready to Race Lightning McQueen™ by VTech®. Cool animations, sound effects and an interactive driving panel add to the racing fun! Never opened or played with. Enseña: Sumas, lógica, a emparejar, memoria, vocabulario y mucho más... En Español. For Use with MobiGo Touch Learning Systems. I have described this to the best of my knowledge. Disney Pixar Cars 2. Ready to Play. E-Reading System. New and sealed. After the Piston Cup, Lightning McQueen heads back to Radiator Springsto hang out with his new-found friends! Vtech V.Reader Interactive E-Reading System. Ages: 4-6 Years. Disney Pixar Cars 2. Classifying & More. REV UP LEARNING FUN IN RADIATOR SPRINGS. GREAT LEARNING FUN FOR AGES 4 TO 6. LEARNING ACTIVITIES INCLUDE. This is a new in the sealed package Disney Create A Story Cars. It was never opened or used. Includes 2 books by vtech for ages 5 years old. A smoke free home. Thanks for looking. You are bidding on a brand new game for the vtech V.Reader called Disney Pixar Cars 2. It is still sealed and in original packaging. It is for ages 4-6. Buyer to receive FREE shipping and will receive email notification that it is on its way. Thank you for looking and please check out the other listings. I will be happy to combine shipping to save you money!!! Disney Pixtar ~ Cars ~ V.Reader VTech ~ Factory Sealed. Motion learning toy like a steering wheel as you drive Lighting McQueen- Ideal for ages 4 6.